It is important to install the aluminum axles with the proper toe in and camber to insure adequate ground handling. Re-install axles using the 1/8" aluminum plates on both sides of the landing gear legs. With fuselage level and on center line, place washers (various thicknesses) between outer aluminum plate and gear to achieve an 8° camber and a 1/2° toe in. The 8° camber can be determined by using a protractor, placed on the top surface of the axle, with a straight edge and level. Any other means is also acceptable. Toe in can be achieved using two 2' carpenter squares. By placing the short end of the square on each axle, the distance between the widest portion and narrowest .portion can be measured. This distance should be .25 in. (1/4") max. to .125 (l/8") min. from the center line of the airplane. From one gear to the other would measure .50 (1/2") max. to .250 (1/4") min. 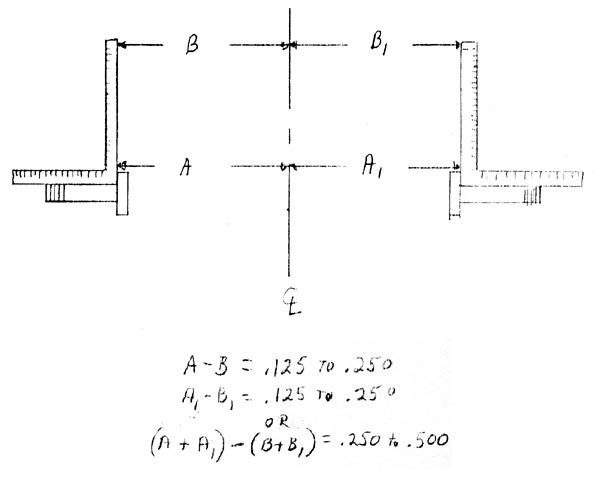 A single carpenter's square can be used if measurements are made only to the centerline of fuselage. Once the proper amount of washers are determined for each bolt, it's time to flox the whole mess in place. Rough sand the aluminum plates for good bond. Some sanding of the gear leg can be done in lieu of washers, if preferred. Loosen all bolts enough to force a medium wet flox mixture between both aluminum plates and the gear leg. A good squeeze out is needed to ensure a solid flat mounting surface. The washers will be floxed between the outboard plate and gear leg. Coat the bolts with vaseline to prevent permanent installation. Re-check camber and toe in and let set overnight to cure. The brakes are made up of three essential components; brake mounting plate, brake disc, and wheel halves. The brake disc is attached to the inner wheel half with three allen head bolts. The next step will be to mount the brake mounting plate to the axle. Remove axles from gear and center the brake mounting pad on the gear leg over the previously, drilled axle mounting holes. Make sure you mark each mounting pad right and left as hole location may be slightly different. "c" clamp in position and using gear legs as a hole locator, drill the four holes through the mounting pad. 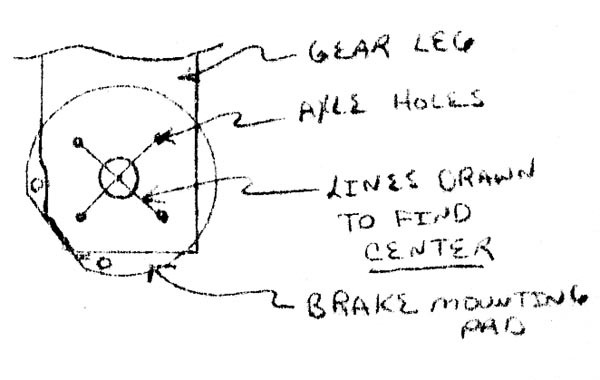 The brake pucks (attached to the mounting pad) should be positioned at the lower rear of the gear leg. Remove and re-install. using axle, mounting plate, spacers, etc. as shown on previous exploded view. Check to ensure clearance between brake puck and gear leg. File or grind gear leg until puck moves freely. The wheel is assembled by first removing the brake disc and sliding it into the brake pucks. Then a spacer, followed by the wheel. then another spacer, and finally. the wheel nut. Proper spacers are important to ensure brake mounting pad and brake disc are in alignment. Brake lines can now be routed and connected to the brakes using the provided #268P Nylaflow connectors. Five min. 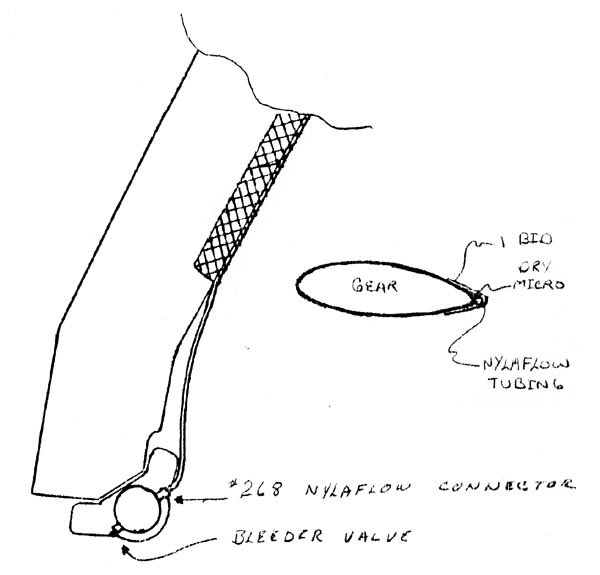 the nylaflow to the gear trailing edge in a few spots, dry micro the gap, then cover with 1 (one) bid overlapping onto the gear leg at least 1/2". Install the brake bleeder valves on the bottom of the brake assemblies and bleed by pumping aircraft type brake fluid from the bleeder valve up to the master cylinder until full. The slotted screw under the rubber boot on the master cylinder will have to be loosened until fluid appears at screw. When full, tighten bleeder valve shut off) then slotted screw and check for firm brake.